God’s light outside the dark room of our mind (greyscale version). The earlier greyscale sketched version of the above scene, used to help me get the tonal contrast right in the final, coloured scene at the top of this page. This imagination picture occurred to me some time ago, today I thought I’d draw it. The room in the picture represents a place in our mind. There are actually lots of “rooms” in our minds. Notice that the room is dark; that’s because it might contain secrets, perhaps things we might be unwilling to admit. Perhaps things we’ve done in our past that we are not proud of. Perhaps things we’ve done, or had done to us, which we are ashamed of. Rooms like this one, full of things we don’t like, don’t want to admit to, or are ashamed of, are often firmly closed (in our minds) by fear, anxiety, regret, etc. 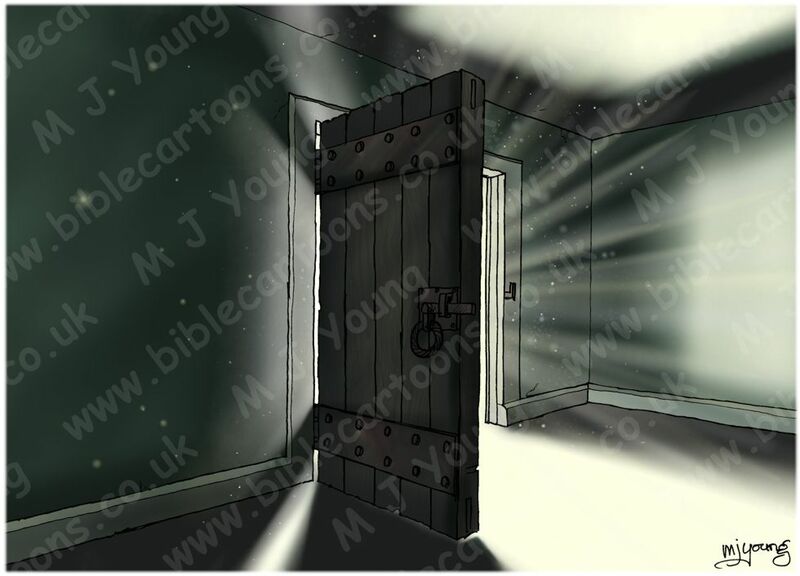 Unfortunately that closed door is also closed to God & His healing presence. The light which we can see out in the corridor, & which is illuminating the scene, is the light of the Lord God’s presence. I enjoyed drawing the light beams coming in to the room, with all the little dust motes floating about in the air! Notice that the door is now open. That’s because the person who’s mind this “room” is in has chosen to open the room up & allowed God to begin to move his light into it. You’d think that God was powerful enough just to barge into any “room” inside our minds, wouldn’t you?! And, of course, He is that powerful… but that isn’t how He seems to operate. He is far too much of a gentleman to do that! No, the most powerful person in the universe actually seems to WAIT FOR US to open the door & INVITE Him into the room. It seems to have to be our choice. Perhaps that is because God doesn’t ever want to frighten us with His force. He prefers to build up trust & relationship with us. And I suppose the only way He can do that is to wait for us to open the “door” to “rooms” in our minds first. Hey, He knows all our secrets anyway, yet STILL He waits to be invited into the rooms of our minds. How gallant God is! So it is US who has to choose to open the door & invite Him into the “room”. That takes courage on our part – especially when we know (or suspect) that the room contains something we don’t want to own up to. My picture reminds me of the famous William Holman Hunt painting “The Light of the World” (1851–3). That is an allegorical painting representing the figure of Jesus preparing to knock on an overgrown and long-unopened door. Apparently it comes from Revelation 3:20 which says “Here I am! I stand at the door and knock. If anyone hears my voice and opens the door, I will come in and eat with that person, and they with me.” The door in the painting famously has no handle on the outside (where Jesus is standing), and can therefore only be opened from the inside; ie by us. You can see how Hunt’s painting & my drawing are similar in this regard & symbolism. More about the light & shadows in Dark room; God’s light. Notice the deep shadows in the room, in my picture. The shadows represent our secret fears or thoughts we want to keep buried. They hide in the shadows of our minds. Notice what happens as the light of God’s presence moves into the room: the shadows flicker & fly off into the corners. 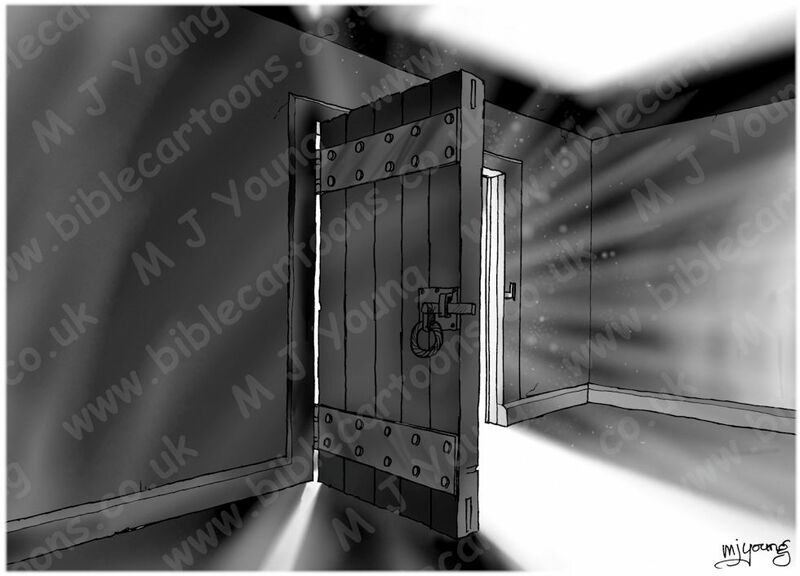 If I drew the next scene, with God’s light fully in the room, then there wouldn’t be any shadows left in there. That represents total disclosure of the rooms contents to God. We have nothing to fear from this kind of exposure & disclosure. Fear (& the Devil) wants us to keep the door firmly closed. But the Lord God wants to set us free from all of our hidden fears, disappointments & past mistakes. The only way we can “let go” of our fears & regrets is to ALLOW our loving heavenly Father access to these “rooms of regret”. Will you let our gallant, glorious, kind God into the “rooms” of your mind & allow Him to free you from your past mistakes & regrets? Sermon/teaching theme suggestions: This picture could be used to talk about the secret places we tend to harbour in our minds. It might be used to suggest ways in which we can turn out these “rooms” & turn them over to the Lord, which will benefit us & our walk with Him.